Women who start to lose their hair often worry that they are going bald like a man, and that their hormones are becoming masculinised. In fact, patchy baldness (alopecia areata) and total baldness (alopecia totalis and alopecia universalis) are unrelated to hormones and occur equally commonly in men and women. 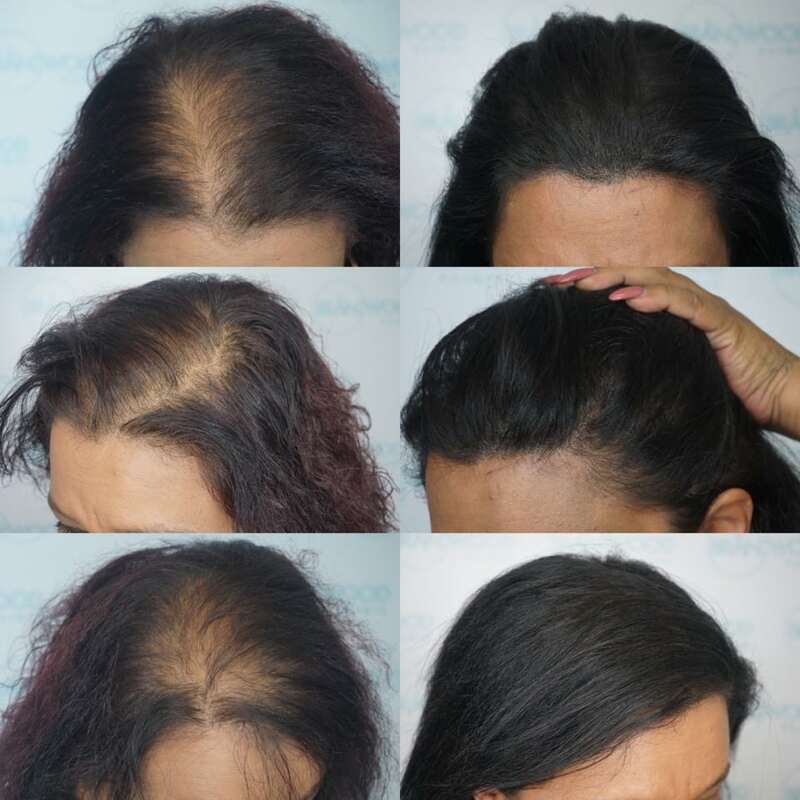 By the age of 50 over half of all women have experienced thinning hair. The effects of the menopause are known to exacerbate the problem. Author and campaigner Elizabeth Steel knew a great deal about women’s hair loss. Having published many books on the subject, she founded the organisation Hairline International to help those living with alopecia and associated conditions. She was a pioneer and a great source for support and advice. A survey by her support group, Hairline International, found that 78% of its female members no longer felt like women, 40% said their marriage had suffered and 63% had considered suicide. Speaking to The Daily Mail, Dr Tabi Leslie, a consultant dermatologist at the London Clinic, says the menopause is a common cause of hair loss. Leslie explains: ‘Hair grows in a certain cycle — growing, resting, dropping out — and when you’re stressed, whether physically or emotionally, the hair switches to the resting phase. This is caused by a combination of factors: poor diet, the menopause and stress. After the menopause, thinning of the hair is more pronounced. Hair can also become thin at the front, similar to the male pattern. This is because the hair follicles are responding in exactly the same way as in balding men to the testosterone in the blood. Levels of the female hormones oestrogen and progesterone fall during the menopause, while testosterone sometimes increases, and this seems to affect hair follicles, causing the hair to thin. All women have testosterone; this is perfectly normal. The balding does not mean that the woman has more testosterone; it simply means that the hair follicles on her scalp are oversensitive, which is probably inherited. The hair will eventually not become any worse. There is no need to worry that you will become completely bald, unfortunately you may consider the thinning to be significant enough to warrant attention. Sally’s story is a typical one. Looking for answers she tried any number of products, shampoos, waxes, thickeners and even a laser comb that promised to ‘stimulate the follicles’! None proved particularly effective and all were costly and time-consuming. 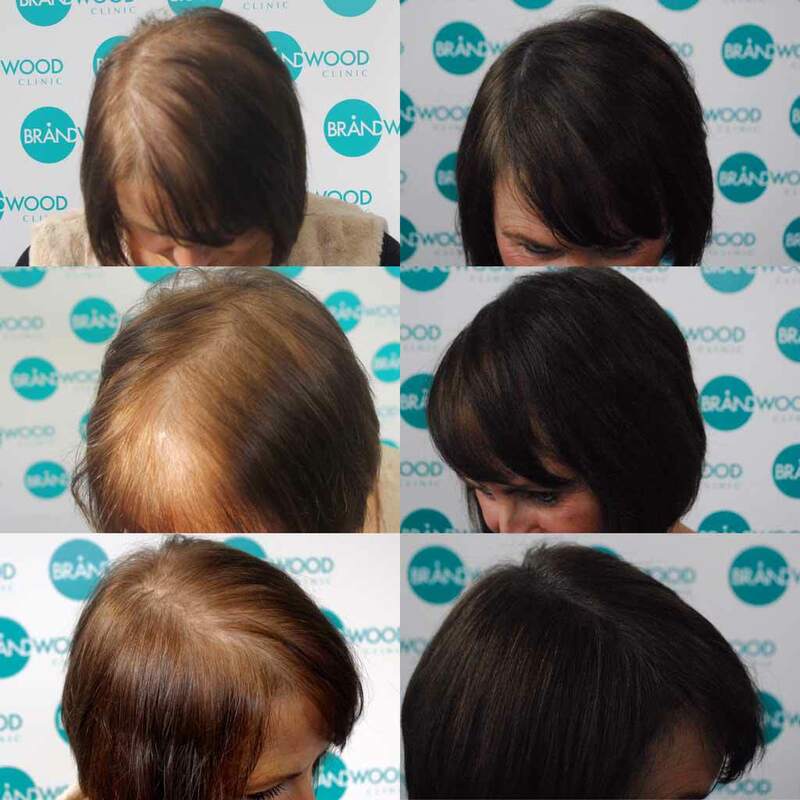 Shamina was struggling with thinning hair after a particularly stressful period in her life. The final straw came when her five-year-old daughter told her that she was looking ‘a bit bald’. 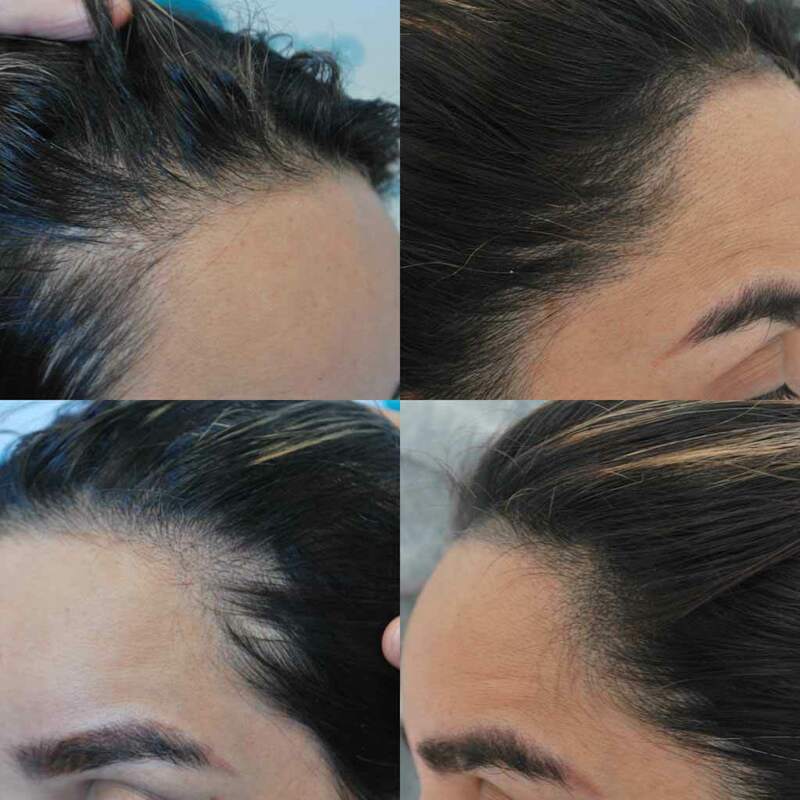 Turning to Scalp MicroPigmentation they have both found a more permanent solution, one that creates the illusion of density and a thicker looking mane. What’s more, once the treatment is completed, it requires very little maintenance or effort. Sally and Shamina worked with senior practitioner Simon Lane to create a look that they were happy with. Simon carefully examined the areas where her hair was ‘sparse’ and applied SMP in a careful and considered manner. His attention to detail and meticulous style was vital to give a natural appearance to their hair. The evidence speaks for itself, both Shamina and Sally testify that their confidence is restored. Furthermore they have both become valued advocates for the treatment. 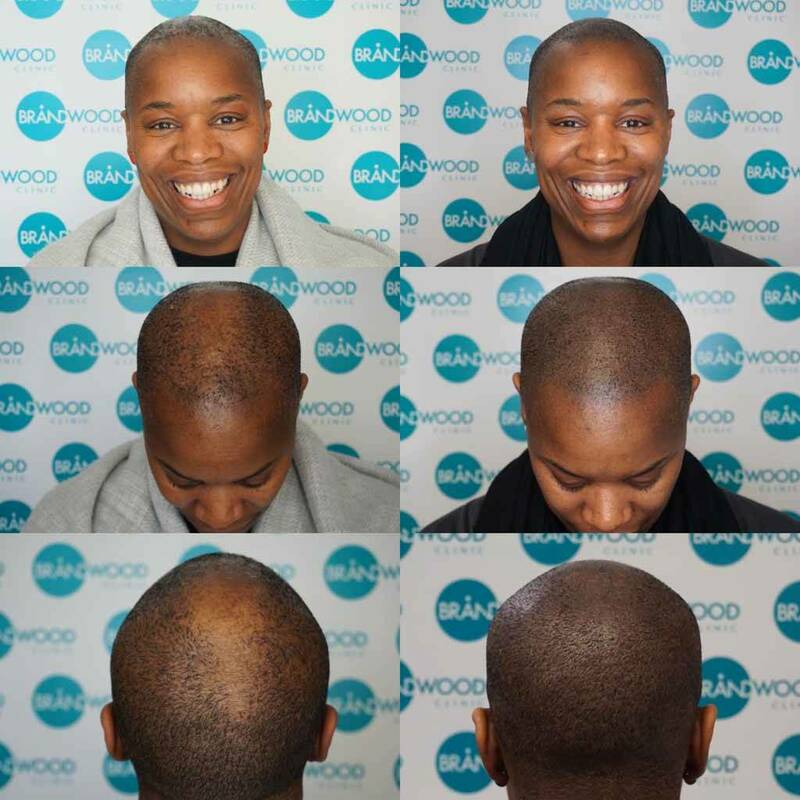 At Brandwood Clinic we treat everyone as an individual and adapt our procedures to deliver the look that you require. We have worked with women and men, adding the appearance of density to existing hairlines. In order to improve the service, particularly for women, we have partnered with Richard Wallace, a long-established local salon with an excellent reputation. In partnership with Richard and his staff, or your own hairdresser if you prefer, we can tailor a style and look which will truly transform your appearance and enhance your confidence. Call us to book a no-obligation consultation on 0121 296 9280 and find out how we are changing lives every day.